Tonight’s spooky set of stories are based on (urban) legends from the American Southwest and parts unknown. The theme tonight? How to get a-“head” in life. The legends in this episode come from the books American Indian Myths and Legends and Scary Stories to Tell in the Dark. This episode is a tribute to the figure of the Dark Mother, with songs, stories, and poetry (by a special guest!). Feel free to send in any thoughts you have about the darker aspects of the feminine divine, particularly those found in folk and fairy tales! Poems are all courtesy of Peter Paddon, host of the Crooked Path podcast, and proprietor of the excellent Pendraig Publishing company. Incidental music was by SJ Tucker (from the Ember Days soundtrack) and Disparition. Folklorists who discuss adornment have concentrated on costume’s socializing force and its relationship to the maintenance of individual and group identities. According to Don Yoder (1972), folk costume expresses identity in a symbolic way; functioning as an outward “badge” of community identity and expressing an individual’s manifold relationships to and within that community (Brunvand 341). One of the items frequently associated with magicians is the magic hat—whether it’s the shiny tophat of a stage magician concealing a rabbit in its depths or the pointy, star-spangled adornment of a fantasy wizard. In American lore the hat has a special place as a magical item, frequently providing either symbolic guidance, otherworldly taboo, or a method of deployment in spell-casting. When people think of American hats, possibly the most iconic is the cowboy’s ten-gallon hat (which, of course, does not hold ten gallons, but the galon hatband worn by Southwestern vaqueros). I remember teaching overseas and asking about impressions of America, and the most common response was that we tend to wear cowboy hats and smile a lot. Given the emblematic nature of the Stetson and its kin and the frequently superstitious nature of life in the Old West, it is hardly surprising that lore has arisen surrounding this headgear. 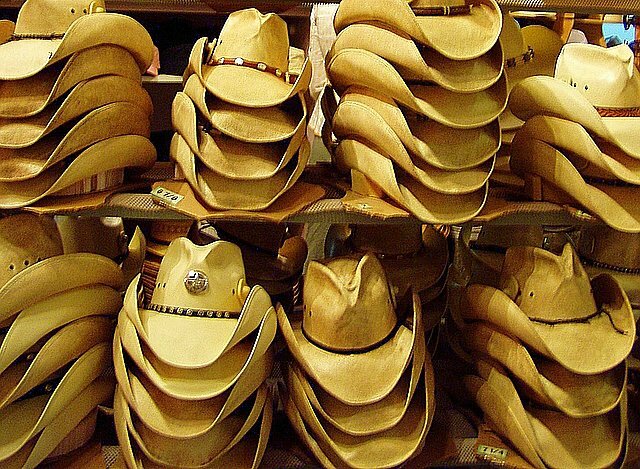 Probably the most common belief surrounding the cowboy hat has to do with what to do when you’re not wearing it. There seems to be an absolute taboo on placing a hat on the bed, which appears in everything from Southwestern rodeo lore to Oregon folk belief. This practice was also found in California by folklorist Wayland Hand, where “[o]n occasion of a miner’s first trip to the mine after the arrival of the firstborn, his comrades simply seize his hat and burn it despite any resistance or protests offered” (Hand 52). This act functions both as an initiatory rite and as a method of preventing bad luck for the child. Hand also notes that the baby was usually made to touch the hat if possible prior to its cremation. A soldier’s hat could also be worn by a woman in labor to give her strength during the birth, furthering the link between children and hats. 9750. If a girl puts a man’s hat on her head, she desires him to kiss her; if a man puts his hat on a girl’s head, he desires to kiss her. 9751. A girl should never put a man’s hat on her head; it will cause quarrels with him. 9752. The girl who tries on a man’s hat will not get him for a husband. 9753. If a woman throws her hat and gloves on a man’s bed, she wants to sleep with him; if a man throws his hat on a woman’s bed, he wants to sleep with her. 9754. A girl can strengthen a sweetheart’s love by laying his hat on her bed when he comes to see her. 9755. The significance of a beau refusing to hand his hat to his girl when he calls on her is love growing cold. 9756. A girl stepping on a man’s hat will soon marry the owner. 9758. If a girl takes the bow out of the hat of each man liked, she will marry the owner of the seventh hat. Clearly some of these are contradictory, as in the piece about one gender wearing the other’s hat breeding either contempt or desire. There does seem to be a very strong connection between hats and sexuality, however, perhaps because the hat sits so close to the brain and retains the warmth of the head, it may be seen to cause ‘feverish’ behavior, such as love, lust, or even fighting. The divinatory rites surrounding hats are also interesting, although I suspect these performances have less to do with any direct effect upon the mind and more to do with other counting rituals related to love forecasting. Several tricks in the practice of old-style hoodoo involve acquiring the band from a man’s chapeau and using it to deploy any number of tricks, mostly designed to influence him in love (or occasionally business). A bit of lore from the Southern mountains tells about how a person can reverse bad luck caused by unfortunate omens (in particular a fearsome rabbit crossing one’s path): [If a] Rabbit runs cross yur path, turn yur hat ‘roun’. (Wear your hat with the back part in front. )” (Duncan 236). This is not much different from the idea of turning around if a black cat crosses one’s path or even turning a key or coin over in one’s pocket after seeing an unlucky sign. In an era when hats are frequently worn backward (if worn at all), this sort of act is probably much less out of place today than it would have been half a century or so ago. So what about you? Do you have any hat-related lore? What kinds of hats hold particular magic for you? The pointy costume ‘witch’ hat? A trucker’s cap owned by a favorite grandfather? I’d love to hear what makes your hat special and whether you ever ascribe anything magical to it. Dar atole con el dedo. “To give gruel with the finger.” (To deceive with words or acts, especially to deceive one’s husband). Entre menos burros, mas olotes. “The fewer donkeys, the more cobs.” (The fewer, the better…corncobs, dried as well as green, are given burros to eat). Each section has its own unique attributes. Some have the songs and proverbs of their region, some have stories and even some loose versions of “spells.” I say loose because they aren’t exactly how-to’s on spellcraft, but provide some information that could be turned into a how-to pretty easily. 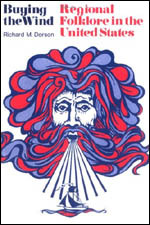 For example, the Louisiana Cajuns section has information on Hoodoo, including a tale from one informant who described a luck mojo bag that “was a little bag of linen and it had like nerves and then bones.” The nerves are from a vulture, and the bones from a snake, which both could be used in a lucky mojo hand (though I’ve never heard of nerves being used, per se, but that’s what makes these accounts so interesting—their variety). The entire book is loaded with bits of magic like this, as well as stories of witchcraft and magic which, while more fanciful, give insight into what the occult practices of those areas might be. In the Southern Mountaineers section, for instance, there’s an interesting account of a “witch-ball,” which is a bit of hair, wax, and other substances rolled into a ball and “shot” at a victim to curse them. I’ve seen similar stories in other books of American folklore, especially based in the Appalachian areas, so it’s interesting to me to see how prominent such a magical tool seems to be in that area, though it is largely forgotten elsewhere. I learned a great deal from this book—the entire section on Illinois Egyptians, for example, was a revelation to me, and has opened up a whole new area of interest for me regarding New World Witchery. And the stories, songs, and proverbs are fantastic! I can’t get enough of the Southern “Jack” tales! I should point out that Dorson uses the Aarne-Thompson system of folklore classification, which divides tales into various types for ease of cross-referencing. It is definitely a book aimed at folklorists and not particularly at a wide audience, but I think anyone can get a great deal from reading it. And it may open up a whole new love of folklore as a field of study for some folks. I’ve been reading a borrowed copy from my public library, and it’s just about due to go back there, which was going to be a sad loss, as I still find myself referencing Buying the Wind frequently. But thanks to a generous donation from reader/listener Amber (many, many thanks to her! ), we’ll be able to procure a copy for future reference now. So hooray for Amber!